PLEASE MAKE THIS YOUR DEFAULT FOR PORTERS FAMILY! WE LOVE YOU LIL MAN AND WILL MISS YOU GREATLY!! oh how I will cry for the chance to meet you is gone, I will cry for the years you didnt get to spend with your mommy and daddy, I will cry for all the wonderful things on earth you never got to experience, like the wind on your face, and the sand in your toes. Eating dirt and collecting bugs. I will cry for all the years of birthday parties and wishes you will miss, and the days of running and playing that you never got to experience. I will cry for your parents and family who will miss you so, and your friends. I will not cry for you though, Because I know you are happy where you are! I cry as I write this letter to you. but only because my heart breaks that I never personally got to see your beautiful face. No matter what you are a Miracle and you will forever be in my heart! as you will be in many hearts. at only 4 months old you have touched EVERYONES lives! I will not cry for you, because now you get to play with thousands of other CHD angels and run and play with no more pain. you will be another one of our Guardian angels. The best part.. you get to meet dear mr Jesus and God Himself. but I really wish I had had the chance to meet my little Hero. You are so perfect. and You will me missed greatly! I LOVE YOU PORTER!! and there will NEVER be a day that goes by where I wont honor and remember you and your sweet face! you were just too perfect for words. the best friend Kai never got to meet! im crying so unbelievably hard right now..
no scratch that Porter has MILLIONS of friends to play with..and he finally got to see the beautiful blue Sky..but not just that he got to see the heavens and meet Our Heavenly Father. Oh the pain I can only imagine his family feels... please pray god to embrace them hold them in their time of need and pain. 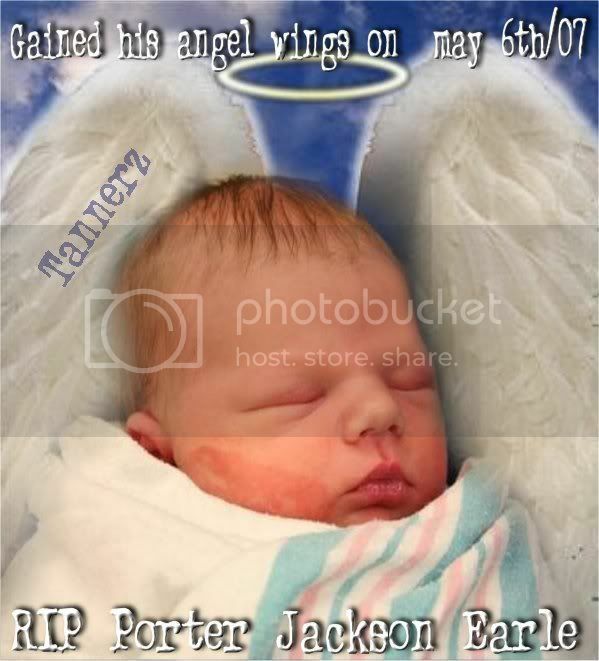 Porter Jackson Earle became an angel today. He passed away silently in his mommy and daddys arms at 2:42pm. He was the most special little boy I have ever met, and I will love him until the day I die. We listened to a CD that John Michael's mom gave to us as he passed away. As with all things, Porter did this his way, and in a way that was a gift to us because we didnt have to make the decision of when to let him go. I will let you all know about arraingements when I know more. I thank you all for your prayers and love.